Performing Arts: Mrs. Warren's Profession The Shakespeare Theatre presents George Bernard Shaw's Mrs. Warren's Profession, starring Elizabeth Ashley. 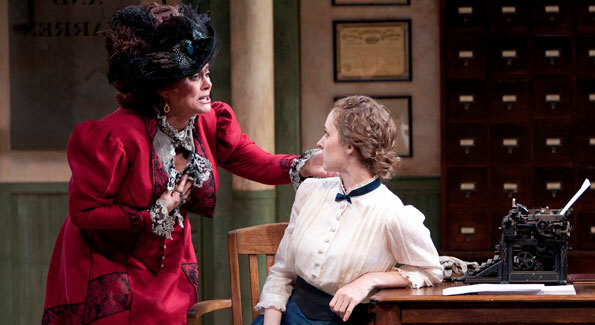 Elizabeth Ashley as Mrs. Warren and Amanda Quaid as Vivie Warren in the Shakespeare Theatre Company’s production of Mrs. Warren’s Profession, directed by Keith Baxter. Photo by Scott Suchman. The Shakespeare Theatre presents George Bernard Shaw’s Mrs. Warren’s Profession, starring Elizabeth Ashley. Returning to the Shakespeare Theatre for her third engagement, Elizabeth Ashley stars in the title role of George Bernard Shaw’s Mrs. Warren’s Profession. Directed by Keith Baxter, Mrs. Warren’s Profession is a tale of an idealistic young girl who is shocked to learn that her family’s fortune comes from her mother’s management of several brothels. The play runs through July 11 at the Shakespeare Theatre’s Sidney Harman Hall. Vivie, a self-described modern girl of 1905, must face the truth about the source of her family’s wealth when her mother, Mrs. Warren, comes for a visit. Learning of the poverty and hardship her mother had to endure, Vivie seems to make peace with the fact that her mother earned her living by managing houses of prostitution. But when she discovers that the family business is still going strong, she believes she must make a choice between a continued relationship with her mother and the moral way of life she believes in. While the subject matter is serious, Shaw’s treatment of it is humorous. Kahn and Baxter put together a wonderful cast, led by Elizabeth Ashley who is, quite simply, brilliant as the morally questionable, but absolutely loveable, Mrs. Warren. Amanda Quaid plays Vivie, Mrs. Warren’s daughter, bringing depth and humanity to this confident, coolly rational girl who may not be able to extend understanding and acceptance to her mother. These two powerful women are perfectly complemented by the men in the cast. Ted van Griethuysen plays Mr. Praed, a charming man, slightly ineffectual, but kind and loving. Andrew Boyer plays Sir George Crofts, a man of no visible morals who is perfectly described by another character as ‘the sort of chap who would take a prize at a dog show.’ David Sabin is Rev. Samuel Gardner, who uses his blustery and gruff nature to cover up a soft heart as well as a brief, but scandalous past. Tony Roach‘s Frank Gardner is high spirited and athletic, eternally young and completely broke, hoping to put his good looks to use and marry for money. Rounding out the cast are Caitlin Diana Doyle, playing the young Kitty Vavasour; Kenneth Cavett, Michael Grew, Ben Loving, and David Joseph Regelmann as the Cockney Bruisers; and Merideth Burns, Charlie Francis Murphy, and Patrick Vaill in the Ensemble. Everything about this production sparkles from its moments of incredible human tenderness to its moments of harsh truths about a capitalistic society and the responsibility of each individual in the trickle-down effect. With physical comedy, subtle gestures and asides, and lines delivered with perfect wit and timing, Mrs. Warren’s Profession is a must see of the season. For more information and tickets, visit their website. 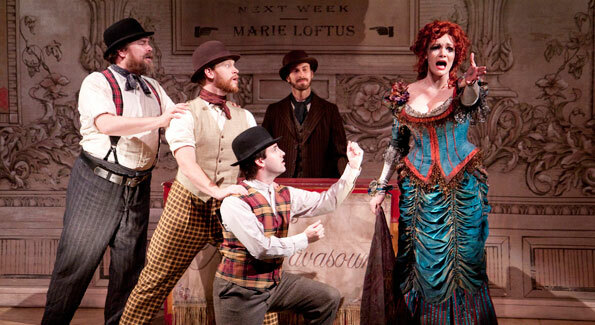 Kenneth Cavett, Ben Loving, Michael Grew, David Joseph Regelmann and Caitlin Diana Doyle in the Shakespeare Theatre Company’s production of Mrs. Warren’s Profession, directed by Keith Baxter. Photo by Scott Suchman. 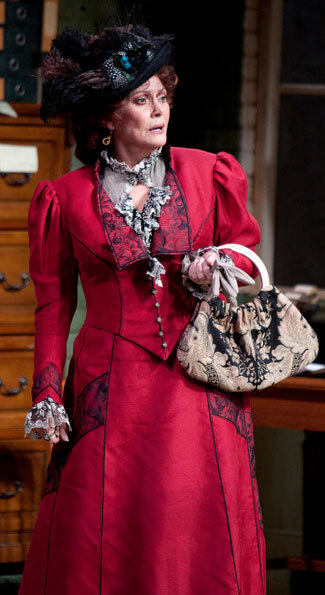 Elizabeth Ashley as Mrs. Warren in the Shakespeare Theatre Company’s production of Mrs. Warren’s Profession, directed by Keith Baxter. Photo by Scott Suchman. Julie LaPorte is a freelance writer, covering D.C.’s theatre and visual arts scene. She graduated with a B.A. in English, with a minor in art history, from the University of Colorado.